Southeastern Grocers recently unveiled 73 new Harveys Supermarket stores in one of the largest single-day grocery grand openings across south. Here's a look into a chain that now includes seven locations in and around downtown and Jacksonville urban core neighborhoods. On November 16th, Jacksonville-based Southeastern Grocers unveiled 73 new Harveys Supermarket stores in one of the largest single-day grand openings across Florida, Georgia, South Carolina and North Carolina. Locally, the event included six stores that were converted from Winn-Dixie to Harveys Supermarkets, bringing the total locations within the city to seven. Forgotten by many, Harveys Supermarket is a throwback to the days of Premier Foods. Initially a small market established in Springfield by Abdo Asker in 1945, for much of the 20th century Premier was a leading grocer in Jacksonville’s inner city neighboorhoods by specializing in items seldom stocked by the larger chains. With locations on Edgewood, 8th and Main, and Beaver Street, Premier abruptly closed in 2005 after its market share fell to 0.45 percent of the local grocery market. Featuring stores with 18,000 to 35,000 square feet, the first Harveys Supermarket was established by Joe Harvey in Nashville, GA. According to Ian McLeod, CEO and president of Southeastern Grocers, Harveys attracts a different set of customers than their Winn-Dixie or BI-LO brands. Harveys Supermarket stores generally cater to less-affluent clientele, with a store product mix that includes more smoked meats, pork and poultry items. “We know that a number of our customers are cash strapped. They’re shopping on a budget. We want to try to make sure that we give them the best value we possibly can,” McLeod mentioned earlier this week. 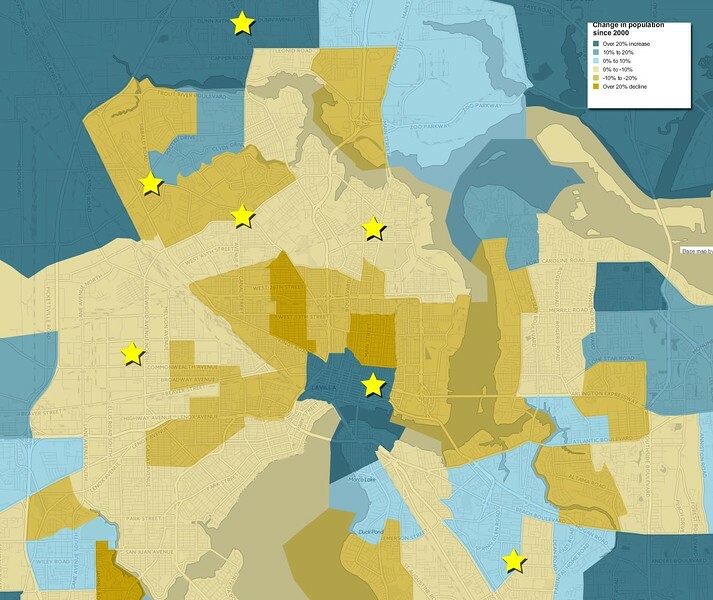 In Jacksonville, that means targeting many of the city’s older African-American neighborhoods generally located north and west of downtown. At the Edgewood location, which served as a pilot for the local market, the average household income for the surrounding ZIP code is around $34,000, compared to almost $65,700 throughout the county. In addition, Harvey’s new downtown location is the only centralized supermarket serving an area of nearly 45,000 residents, including food deserts in Durkeeville, New Town and the Eastside. A design concept characterized by contemporary interior signage and bright colors, the average Harveys store contains over 2,200 items reduced in price – easily identified by “Great Low Price” tags – great low prices, whether on-sale or off-sale. 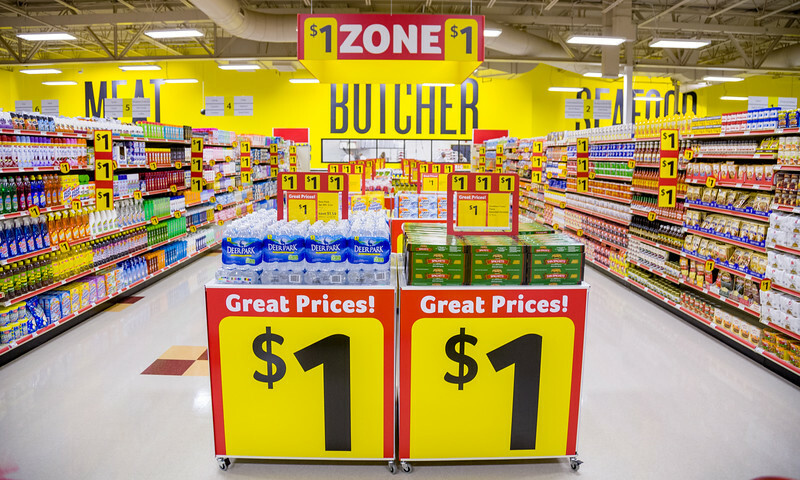 Stores also feature a $1 Zone, where 600 items ranging from beverages, canned goods, cleaners and meals, to greeting cards, baby and health items can be purchased for $1. Furthermore, customers can expect to find expanded meat departments featuring smoked meats and value meat selections, produce from over 90 local farmers, and a health and beauty care section with more than 250 products to choose from. Here’s a look inside Jacksonville’s newest brand of grocery stores!